I've just returned from a 3-week long jaunt around the world that included stops in Frankfurt, London, Winnipeg, Leipzig and Munich. In that order too, which meant a crazy loop of the globe in the middle of the already unbearable Australia to Northern Hemisphere journey. In London, I had a brief stint at the British Library, a wonderland for researchers interested in somewhat ephemeral texts like Victorian girls' books. As the BL was a copyright library, the odds are that they hold one of every book commercially published in the United Kingdom. So where that frivolous, childish book of no account was thrown out, read to ruin or simply deemed unworthy of archiving elsewhere, one, usually-untouched copy, is usually hidden away in the St Pancras vaults. For my current project on colonial girlhood, I wanted to see if I could find any books and magazines for British children about the colonies. 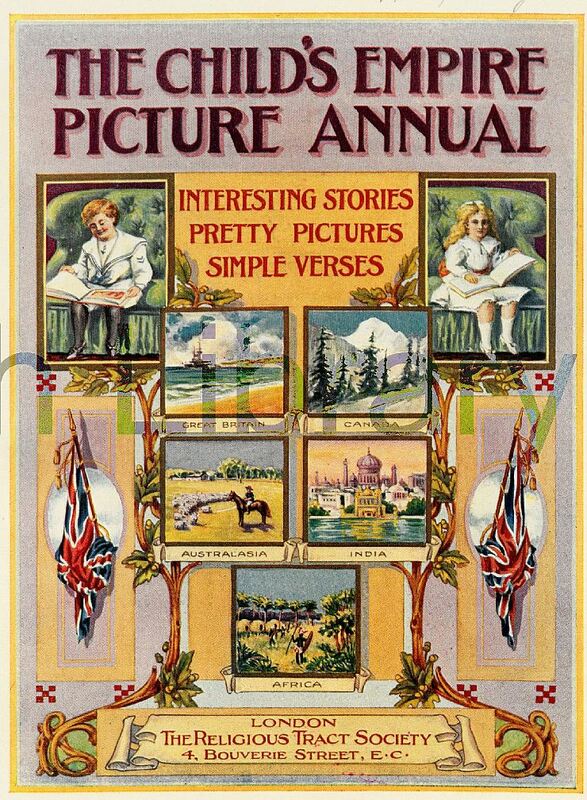 I was congratulating myself for my sheer awesomeness in merely typing some terms into the catalogue when it returned the result, "The Child's Empire Annual" (1912). When I opened the book, I saw the amazing frontispiece pictured above. We have drovers running sheep in Australia, snow capped peaks in Canada, the astonishing Taj Mahal and an African tribe glancing out at the reader, prefiguring The Gods Must Be Crazy by 70 years. This was going to be it in showing British attitudes to Empire for children. Strangely, the volume, and the subsequent ones I looked at, made nary a mention of the countries of Empire. There were a few token references in the first volume, so as to live up to the title, but it seemed that the idea of an Empire annual was more important than the practice. Unless the idea was that the children of the Empire should read the annual? 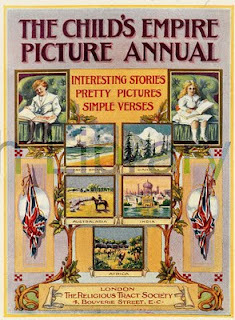 The story was the same for The Empire Annual for Girls (1909), whose cover featuring heart-shaped topiary intimated how little rough-and-ready content the book would contain. 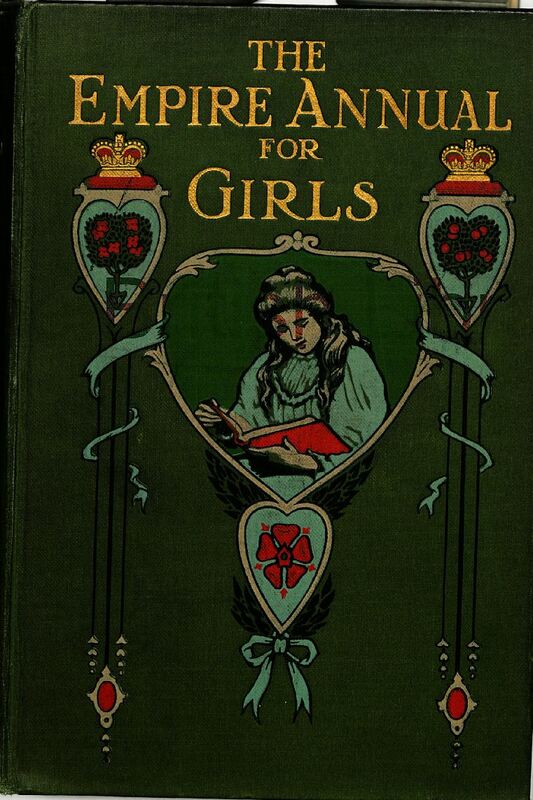 The Girl's Realm was an amazing magazine for girls that was published from 1898 (you can read a whole article about it in relation to the Boer War here). In comparison with the Girl's Own Paper, it is so much more progressive and interested in girls' lives beyond the home. 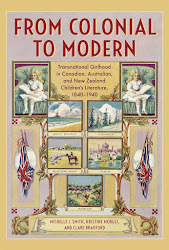 Perhaps, as my scholarly friend and author of the above article, Kristine Moruzi, suggested, this is explained by the 18-year distance in its debut in comparison with the first edition of the GOP, but it was exciting to come upon lengthy articles with photographs of girls in New Zealand and Australia from 1899/1900. Not only that, but they included Aboriginal and Maori girls within them! There's also room in the magazine for a story by boys' adventure fiction writer G.A. 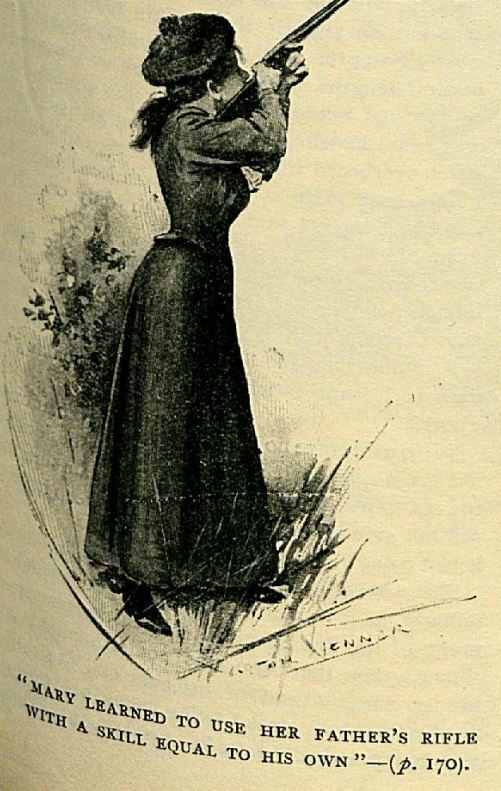 Henty in 1901 called "A Frontier Girl: A Tale of the Backwood Settlement". It features two illustrations of the heroine, Mary, boldly wielding a rifle. She can shoot "with a skill equal" to her father, and no wonder that's she's perfected her aim with all the "Indian attacks" that are crammed into the tale's five pages.